Here at Cool As Publicity we can certainly spot a special product and we were intrigued the moment we set our eyes on the bottles of Casanova Prosecco. Not content with producing the finest Prosecco to taste through their traditional Italian methods, Casanova has also invested significant time and creativity into ensuring that their stunning bottles match the contents in terms of luxury and elegance. So much so that they’ve recently launched the world’s most expensive bottle of Prosecco through their partnership with Swarovski to produce crystal encrusted bottles. Prosecco has never been so popular amongst drinkers at home, at events or when dining out and they’re taking this trend to the next level, demonstrating their passion to produce not just a sparkling wine, but a true work of art. Bursting with passion and taking great inspiration from their namesake, Casanova, one of history’s greatest lovers binding true Italian flair and romance, it’s no surprise this sparkling wine has already established itself as a favourite among the world’s social elite. Raising the bar across the Prosecco market, Casanova joined their leading producers with exceptional design professionals to create a truly stunning product. The bottles themselves provide an additional touch of opulence with each bottle adorned by a luxurious velvet crest of Casanova’s striking logo and a further layer of golden ornamentation. The bottle’s velvet encasement is entirely waterproof so that you are able to enjoy its beauty and elegance long after the contents has been enjoyed. For those seeking to add style to an occasion, Casanova produce The White Collection with their exceptionally designed all white and pink bottles, which come presented in a matching white jacket to further add to the elegant appearance. The striking presentation makes it a perfect choice for weddings, engagement parties, summer events, or any special occasion that requires a touch of class and romance that’s sure to impress. Casanova Prosecco is available in selected venues, which include The Ritz Carlton, Mews of Mayfair, Library Members Club, Sanctum Hotel and Le Petit Sud (cheese and wine) bar housed within Baglioni Hotel. Casanova Bottles can also be purchased online from the Casanova Prosecco website www.proseccocasanova.com priced from £11 to £19. 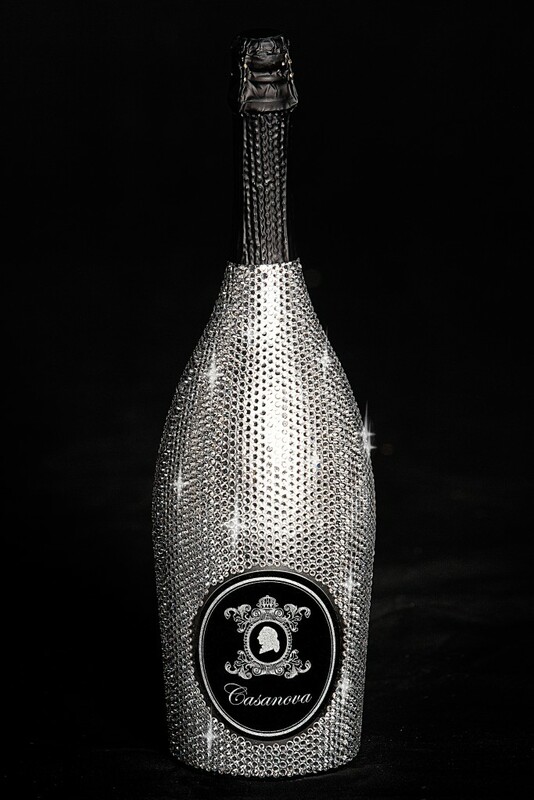 The limited edition Swarovski bottles are currently only sold in Novikov and or directly from Prosecco Casanova with personalization options priced from £1290. For further image, press or interview enquiries please contact Gabby at Cool As Group on [email protected].